In this interview, Ingrid Bryant, a long-time resident of Oviedo, Florida, recalls her experiences growing up and living in this community. Bryant discusses her birth in Munich, Germany, in 1944, during the height of World War II, and her subsequent immigration to the United States. Bryant reminisces about the difficulties that faced her in Orlando, specifically her language barrier. She then goes on to talk about her success at Oviedo High School, her eventual mastery of English, and her decision to become an American citizen. Bryant talks at length about her family and her love for Oviedo. She also highlights her efforts to obtain a Catholic Church for the Oviedo area and her membership in the Oviedo Historical Society (OHS). She also voices her strong feelings about the new plan for Oviedo’s downtown and her desire for the creation of a museum to showcase Oviedo’s rich history. Oral history interview of Ingrid Bryant. Interview conducted by Erin Montgomery at the Oviedo Historical Society in Oviedo, Florida, on March 21, 2015. Bryant, Ingrid. Interviewed by Erin Montgomery, March 21, 2015. Audio/video record available. Oviedo History Harvest, Oviedo Historical Society, Oviedo, Florida. 14-page digital transcript of original 28-minute and 34-second oral history: Bryant, Ingrid. Interviewed by Erin Montgomery, March 21, 2015. Audio/video record available. Oviedo History Harvest, Oviedo Historical Society, Oviedo, Florida. Oviedo Historical Society Collection, History Harvest Collection, RICHES of Central Florida. Originally created by Ingrid Bryant and Erin Montgomery, and published by RICHES of Central Florida. Uh, but to just, uh, keep the audio, um, clear—I guess is the—the idea, um—and less noisy. So do you have any questions before I start asking you questions? Okay, alright. So, um, where were you born? I was born in Munich, Germany, on February 21st, 1944, in the height of the Second World War. My mother married an American soldier in 1955, who brought my brother and I—my brother Norbert and myself and my mom to America. They—he was with the [U.S.] Air Force. he was stationed at Pinecastle Air Force Base, which is now the jetport that we have for—that was the Air Force Base, and, uh, we went to school in Orlando—Cherokee Junior High School—my brother and I.
I, unfortunately, never applied myself to learn English. It—it wasn’t really offered in Germany in those days yet, and so I came here not speaking English. My grandmother told me that if I didn’t like America, that I have to give it a year, but she’ll send me a plane ticket—no, not a plane ticket. She hated planes. A—a boat ticket to come back to Germany. Well, I arrived in America, stepped on American soil on January 3, 1958. So I said, Well, you know, grandma’s gonna get me back home, so I don’t really need to stay here, because the children can be quite—not so understanding about anything that’s different than what they’re used to. So I was being made fun of ver—uh, very badly and it hurt my feelings, ‘cause I was[sic] always wanted—wanted to fit in. That didn’t happen in Orlando, and they—they really didn’t know what to do with me, ‘cause there were no ESOL [English as a Second Language] lessons. So here’s my year: uh, we get a, uh, telegram December 15th that my grandmother had passed. so there went my chance at ever getting back to Germany. So I said, Well, Ingrid, got to make the best of a bad situation, and my mom, in the meantime, knowing my difficulties, she found this place called Oviedo. I went to Oviedo High School, and, uh, it was completely like night and day. They accepted me, and my English teacher—she told me, “When you graduate from Oviedo High School, you will be speaking English.” I said, Yeah, right, and, uh,my math teacher let me do my math wor—you know, the way I worked my problems the way I was taught in Germany. She said as long as I worked the problem—Ms. Deshaso[sp]—then—and I have the right answer, then she would accept that, so that worked. My history teacher—God bless him. He was also the coach of Oviedo High School, and he—He was the most patriotic man you would ever wanna meet, and he instilled the love of America to me. I already knew America was special, however, the way he taught history—and in 1960— was the first year that we had Americanism vs. communism. They brought in an ol’ TV, like we used to have—black and white—and we had an hour of that a week, and I said, Oh, my goodness, you know, with this—and then Sputnik and all of that happened right about that time. So in 1967, I became an American citizen. I was given a booklet to read, that I read from cover to cover, memorized whatever I could, and when I got there to the George C., um, Young [Federal], uh, Courthouse, which is now the Diocese of Orlando in Orlando. They bought that building. I went there and I thought, Oh, boy. I am good to go, and I get to the examiner and she asks me three questions: Who is the first president? Who is the president now? And what are the first two—Ten Amendments to the [U.S.] Constitution? And I said, “Now what?” She says, “That’s good.” she says, “good.” I[sic] says, “I know you can write English.” I say “Yeah, but is that all your asking me when I memorized that whole book?” She says “That’s all I need you to do. You know what you’re doing,” and so I became an American citizen in September, and then I—I had gotten—no let me backtrack. My brother, Norbert, that came to—from Germany with me—he was a year younger than me. that’s him up there, and, uh, He, uh—he, uh, kind of excelled, because he went to the accelerated schools in Germany that we start—we’re at fourth grade, and they test us, and then we are separated to go to über die Realschule, which he did, but, of course, his silly sister that was older than him didn’t measure up. So he—he did not have the difficulty learning English like I did. He had one of those photographic minds. He could just—but when I came to Oviedo, there was one—another culture shock waiting for me. I had to repeat the ninth grade, which put me in the same grade as my brother, which at the time was a big help to me, but was also not what I wanted. 1963, I graduated with my brother on June 10th. July—I mean June 23rd, I married an Oviedo boy. July 16th, my brother Norbert was killed in a car accident. it was an accident. So he’s buried at the Oviedo Cemetery. So that was very difficult, very difficult, ‘til this day, I miss my brother, but from the marriage I had from my first husband, I have three children: Christopher, Patricia, and Tina—Christina. I had to name her after her brother, because he wanted a brother and she had turned out to be a sister. so he got a sister named after him. Then I—I had a little difficulty with my first husband when I wanted to name our first child, which was Christopher, after my brother, Norbert. He wouldn’t—he didn’t want me to do that. So I didn’t. Then, I married my second husband, after that marriage didn’t make it, and his name was Norbert. He was German like me. I said “God, you have a sense of humor, don’t you?” I was 35 years old. I end up pregnant, and I have my little Norbert. He’s now 35 years old. So that worked out to my favor too. From my four children, I now have nine grandchildren and four great-grandchildren, which I’m a very blessed lady. My other thing that—Oviedo has been holy ground to me. They’ve been good to me. When I wanted a job, they had an, uh—they needed a customer service rep]resentative for the City of Oviedo. This was in 1986. At that time, they hired me for the water department to collect the monies and do—be accounts receivable, so to speak. I was good at math, and, uh—so I went to work and my boss interviewed me—A. M. Jones. They named the water plant after him, and he says, “Mrs. Ingrid, why would you wanna work in Oviedo? You’re never going to make any money here.” I said, “Because I want to give back.” I said, “You’re going to pay me a living.” I said, “I want to give back. You—Oviedo taught me English. Oviedo took me in, and made me feel very special.” So he hired me and I retired there in 2004. At that point, all along, when we came from Germany, there was never a Catholic church in Oviedo, and my mom—he wrote the Vatican in the early 60s, and they gave us a priest to come out and say Mass in Chuluota at the [Chuluota] Sportsman Club—it was called—which is now the Girl Scout [Citrus] Camp in Chuluota. So she managed to do that. When they decide—and the developer of Chuluota gave us seven acres so we could build a church and a school, and that was back in the early ‘60s. So the Diocese of St. Augustine, which was—we were under, at that point. the Orlando Diocese wasn’t established ‘til 1968. Bishop Joseph Patrick Hurley decided to build St. Joseph’s [Catholic Church] in Union Park first, and he said we would be next. Well, that didn’t happen. So I kept—when we came to Diocese of Orlando, I decided to go on a writing campaign. I like to write letters, and, uh, I would ask the bishops, you know, “Can we have a Catholic church in Oviedo?” And I’d get letters back saying—they couldn’t say we didn’t have any property, because we did—Chuluota-Oviedo. To me, it’s about the same, and so they told me, “We have no priest.” so—okay. I bought off on that. So 1996 comes along, and my mom passes away, and on her—she’s 71, and on her deathbed, she said to me, “Ingrid, you still don’t have that Catholic church.” I said “Mom, I been trying.” She said, “Try harder.” About the same time, this doctor comes into my office, who moved into Oviedo. No, actually, he came earlier. Let me back track. He came in earlier, and I noticed his name was Carlos Velez-Munich. I said, Munich? Dear Lord. Is this another sign? Just like my little Norbert that I managed to come—that came—that I wanted. So I got to meet Dr. Velez, and they had a meeting, and he got us an appointment with the—with, uh, Father [Richard] Walsh, in St. Margaret Mary [Catholic Church] in Winter Park. He got us a—an appointment with—you’re not going to believe what bishop that was—Bishop Norbert [Mary Leonard James] Dorsey. So that is what started the—getting Most Precious Blood Catholic Church. So there was a standing joke in the [Oviedo] City Hall that if Ingrid ever gets her church, she can address the property. So I just came back from Barbados with my aunt, and, uh, my friend called me and she said, “Ingrid, you have to”—Laura Feldman, and she’s Jewish, mind ya. I’m Catholic. She says, “Ingrid, you have to come down here. Diocese wants an address for this property, and I can’t move until you come and do it.” So I addressed the property: 113 Lockwood Boulevard, and so then we had our first Mass on the 24th of April, 2005, which we’re now having our anniversary—for 10 year anniversary. Unbelievable. Un—incredible what this town has meant to me, along with everything goes along with it. So I consider myself blessed. Now, my passion was getting the church, which I succeeded. My other passion is getting a museum in Oviedo. We had—I—I love the [Oviedo] Historical Society, and I’ve always been involved in history,’ cause in Germany, history has always been right to the forefront. I mean—we try not to let history repeat itself over there, but it did with two world wars, but again—so I’ve been on a kind of a mission—sort of wanting this museum, and when Mrs. Clara [Lee Wheeler] Evans made a bequest of an acre property on Oviedo Street for the historical society to have—because I felt we were the little red-headed stepchild. Child—children, because we never had a place to meet. So we would go from this church to that church, to here, there and yonder, you know, and so she made that bequest. Well, unfortunately that was—she passed away, and that was kind of passed over by the City, buying the old [Geneva] Post Office building that’s on Geneva Drive to make a senior center. So I was just a little bit taken aback by that, because when I questioned her one time, I said, “Well, you know we do need someplace,” and she says, “Are you doubting my word? I told you we’d get an acre of property,” but that didn’t come to fruition evidently, because the—it’s an off-trade now for the post office, which, uh, her family sold to the city for $400,000. I was upset with that, because I’ve been here forever, I knew how—when it was built, and I just—I—I’m just, you know, I don’t understand this at all, but evidently the City and the powers that be in the historical society decided to make that happen. Now, it hasn’t evolved to what it’s supposed to be, because I do believe they have now put the new downtown of Oviedo—south of Oviedo—on the forefront, which I personally have to agree to disagree with the [Oviedo City] Council and with the Mayor [of Oviedo] for doing that. Reason being: there was[sic] only two defined downtowns in Seminole County. One is Sanford. One was Oviedo. So I know the road is going to be cut through, but I thought maybe they would do what Sanford did and embellish what they had and work with that, rather than spend all this money with a new downtown that I, uh—I’m—I don’t understand. Let’s put it that way. I do not understand the logic behind this. I was there. I was there. I lived south of Oviedo, and the Attamoochee[sp] site was the site they built the university on—had three buildings. It was—it was something to behold, and that was in 196—they didn’t build it in 1963, but they made it happen in 1963, the year I graduated. So I have a daughter that graduated from UCF [University of Central Florida], I have a son in-law that graduated from UCF, I have a daughter in-law that graduated from UCF. And it goes on and on and on, and I am one happy girl, and the school has made me so proud, because you—I mean it was FTU—Florida Technical University, and now, as it’s almost—I do believe the second—third—second most populated school in U—United States. So that’s something to be proud of—for them being, uh, right there by Oviedo. Oviedo is special, and hopefully and prayerfully, after my life is done it’ll continue to go on, and please remember always: blend into Oviedo. Don’t try to change it please. Oh, we had a teen club. There—there you go. Okay. Sor—sorry about that. [laughs] Don’t worry about that [laughs]. What was my favorite place in Oviedo? Was the teen club we created out in Chuluota, and I, as a non-citizen, became president of that [inaudible] [laughs]. Of that teen club. We had dances on Saturday nights, and as far as—Oviedo had one thing that I can call to mind, at that time. You have to understand we were very small, and we had a swimming pool, and every Tuesday, we would go down on Magnolia Avenue in Oviedo, and Tuesday night, we would have a teen night there, and we would dance and swim and do whatever kids do. Yes, that was it, and, uh, they did, however, close that swimming pool down, so it’s not there anymore. I think it’s a tennis court now, and, uh, we had one grocery store, the Country Quick. And Miss Ingrid don’t do Facebook, because I’m from Germany, and I think to myself, My God, this is a double-edged sword. It’s too much information, and it can be used very badly. So the one thing that I would like to have Oviedo have again is a newspaper. Our newspapers are all gone, so it’s hard and difficult for the older people to find out what’s going on, just like last weekend, the Taste of Oviedo. I mean—it was well represented, however, not advertised in the paper. I get The Orlando Sentinel, but we get bits and pieces, but I love The Seminole Chronicle. That gave information that was pertinent to our area, what we had going on here, and I feel with 35,000-plus people, please, somebody do us another newspaper. Larry Neely had his newspaper back in the ‘60s, and it was called The Outlook,and then it became The Oviedo Voice, and I think The Oviedo Voice is—is in existence, but from what I understand, when taking to the Mayor, they’re all struggling right now, even The Orlando Sentinel. So—and I’ve read that forever, but that’s the one thing I would like them to have. We’re getting the hospital, which is a good thing. I am so happy. I—I’ve prayed about that, and things are evolving, and maybe the new downtown is thought by somebody, you know, that might know better than I do, but I just thought that the old was quaint and was what Oviedo was. More so than the apartment buildings that I see going up. I question that. Why—and the Albertsons across the street—but I don’t want to complain. It will all work itself out, Hopefully—prayerfully. So—but the museum—I still want a museum. I do, and maybe—hey, I got a Catholic church after 40 years of praying [laughs]. It just might happen. Maybe not in my lifetime, but other people’s. Are there any other question that you have? Um, is there anything else that you miss about Oviedo from your youth? Knowing every car that went by my house, knowing that if my—if it rained outside and the laundry was on my clothesline, somebody’d come in and put it in my house. We didn’t have locked doors. We had so much going. everybody—it was just a different life that, right now, it—that’s passing, but the only thing I would get mad at back then—when somebody would take my laundry back in from outside because it rained—my neighbor mostly—is that she didn’t fold it [laughs]. That—yeah, I miss the—I miss the closeness of the people, you know, anymore. it’s—I still have lots of friends here, because I had a position in the City where people knew me, and so I—I—I treasure my customers. You want as a customer service person anymore, but these are things that, you know—yeah, but I love Oviedo. In spite of everything, I love Oviedo, and love my police chief too, because he helped me catch a criminal that burglarized this house, and, uh, we caught her. I—like I said, I love Oviedo—period—and I want what’s best for Oviedo, and I want it to go on and on and on and be the success that it is, and who knows? Someday, it will be as big as Munich. One million population, which will make me happy [laughs]. Maybe not anybody else, but me, ‘cause[?] I’ve always been a city girl. So why did you choose to stay in Oviedo your whole life? I go to Germany pretty much every year to see my relatives over there that I have, and—but Oviedo’s my home, and I have, eh—everything that I have built up is Oviedo. So, yeah, I’ve stayed. Is there anything else you want to say or talk about before we end? I just keep my Oviedo as special as it—as it’s always been, and maybe, if there’s—if by some chance, we could get a museum [laughs] to where people in the future know that we were the celery capital of the world, and all the people, the backbone of the community that has already passed on, the people that I miss dearly, especially Clara Evans, uh—yeah, keep it going and—and build a museum, and life would be good. I really, really do appreciate you doing this. So thank you. I appreciate doing this with you and thank you for come—for coming again. Previously known as Orlando Army Air Field #2 and Pinecastle Army Airfield, and later known as McCoy Air Force Base. Formerly called the European Recovery Program (ERP). Bryant, Ingrid. and Montgomery, Erin. 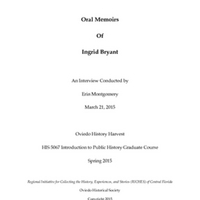 “Oral History of Ingrid Bryant.” RICHES of Central Florida accessed April 21, 2019, https://richesmi.cah.ucf.edu/omeka/items/show/6503.